Over the years I have given quite a number of public lectures and one question that is always asked is “if I wanted to know more, what books should I read?” The books listed below are certainly a good start; however the point needs to be made that real understanding comes with the handling and the seeing. For those that are interested in purchasing books, I have also included links to the various websites that I have found so far, plus a free download of a collection of Sufi poems. 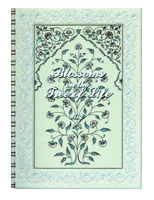 Blossoms on the Tree of Life is a collection of poems by my dear friend and Sufi teacher Alif (George Bourne), from Christchurch. It was always Alif’s intention to make his writings accessible via the internet to anyone who wanted to read them. Unfortunately, with his passing it really looked like this was not going to happen and that this collection of enchanting poems would be limited to the few hard copies he had printed and given to Friends. However, after a number of conversations with his wife Alifa, and with her permission, we have decided to make it available through my website until we can come up with a better option. This collection of poems is a work of sublime beauty, a record of one man’s remarkable journey within and to read them, to quietly reflect on them, is to be Alif’s Friend and travel with him. Simply click on the pdf size below that you'd prefer to download. (Essentially covering everything one would want to know about Persian carpets from the tribal pieces of the Qashqai, the Senneh Kurds and the Luris, to the fine quality weaving of Nain, Kashan and Tabriz ). This has been my most expensive book to date, but worth it. (Ford covers just about everything with carpets from everywhere including Turkey, Iran (Persia), India, Afghanistan, Pakistan, The Caucasus, even Bulgaria, Albania and Romania). First published in 1981, I would regard Ford's book as the worthy successor to Edwards' – it is “The New Testament”, well written, not overly technical, magnificently illustrated and comprehensive. Given that the world has changed so much since publication, it probably is a little out of date and I would love to see it updated, documenting the changes that have taken place. 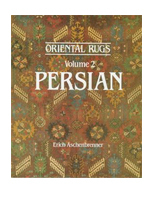 However, if one wanted just one book on oriental carpets, this one would have to be it. (Persian Tribals; Qashqai Lurs, Afshars, Kurds, Baluchi … both carpets and kilims). This charming book really was a labour of love and for that reason alone it has a well-deserved place in my collection. During my early travels up into and around Iran it proved really useful as a Persian tribal carpet identifier. Thirty years ago I paid a small fortune for what I thought was a first edition – it wasn't, but nevertheless as tattered and worn as it has become, I still prize it dearly. 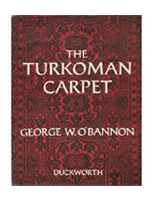 “Don’t judge a book by its cover!” I found a first edition of “The Turkoman Carpet” in Saeed’s Book Bank in the North West Frontier City of Peshawar, sometime in the early 90’s. I bought it, not because I thought it was any good, it certainly did not appear to be up there with my other books, but because it would be another one for my collection. So it stayed on my bookshelf for years until one day, more out of boredom than any thing else, I started thumbing through it and what a surprise. 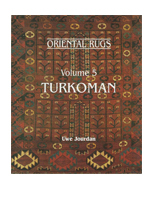 There are not a lot of photographs, but it has a number of diagrams that give an insight into Turkoman designs and their provenance, and as you would expect from a man who was a onetime editor of “The Oriental Carpet Review”, very readable. (Tribal rugs and collectibles from Iran, Afghanistan, Turkey, the Caucasus and Central Asia). If there was ever one book in my collection that I would have wanted to write, this is it. 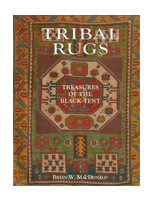 Brian MacDonald has produced a magnificent book that has been described as one of the very best on the subject of tribal rugs. But for me it is so much more, it is simply beautiful. What comes through very clearly is the author’s passion for his subject. There is an emotional quality to Brian MacDonald’s writing that not only informs and educates but also allows us to see his world through his eyes in such away that he leaves us with a yearning to know more. 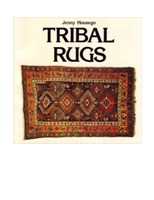 I have heard a rumour that Tribal Rugs is about to be updated and republished and, if this is the case, then I will be adding a copy to my collection. 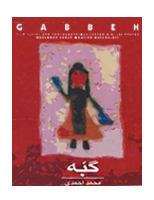 Gabbeh is a movie from the highly acclaimed Iranian director Mohsen Makhmalbaf and it received rave reviews from all around the world when it was released in 1996. One critic wrote that it was, “A fable, a work of visual fancy that resonates with the lyrical power of poetry”. And so it does. A year later this book was published and it contains both the script and page after page of absolutely gorgeous stills from the movie. I thought that “Gabbeh” was going to be about the carpets of the same name, and while a carpet does feature in the story line, it is in fact the vehicle for a whimsical love story. I loved the book so much that during a visit to Tehran in 1999 I arranged for my agent to contact the publisher and I ended up by buying everything he had in stock, I think somewhere around 400 to 500 copies. Since then I have sold or given most of them away. Before writing this review I spent an hour or so going through “Gabbeh” once more and realised that as beautiful as the movie is, its real importance lies in the fact that it documents a way of life that has all but vanished. That it does so so enchantingly is a bonus. 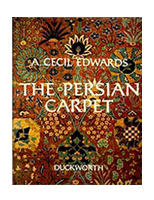 Published in 1979 this is the first book on oriental carpets that I ever bought and 37 years later I still find it readable and informative in a way that fills me with both envy of, and admiration for the author. 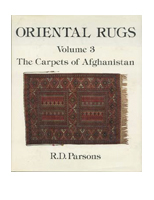 I am envious because as a carpet dealer, Richard Parsons was able to do what I never could and what would now be absolutely impossible for me – he lived and travelled around Afghanistan for seven years. And I admire him not only for is immense knowledge of the rugs and collectibles of the region, but also for his obvious high regard, dare I say, his love for the Afghan people. He discovered what I did, that ultimately what we do in our business really isn’t just about the carpets, it is also about the people we meet along the way. This book was updated and republished in 1989 and now takes into account the changes in Afghan carpet weaving that have come about as a consequence of the Russian invasion and the civil war that has ravaged the country and devastated the lives of its people ever since. 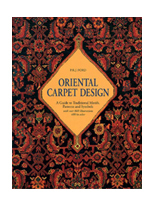 In a way this publication falls into the category of oriental carpet books that I tend to ignore because, for my tastes, I thought it was too much like a “text book”. However, having acknowledged this prejudice, I would have to admit that this excellently illustrated book is an absolute must for anyone who is seriously interested in the weavings of the Turkomans. So while it doesn’t have the feel good factor of most of my other books, I would recommend it as the ultimate Turkoman identifier. A word of warning! Unless you are German speaking you will need to ensure, particularly if you are ordering on line, that your purchase is Ian Bennett’s superb English translation.